Art has always been a part of Jesse Wilson’s history. And he has designs to keep it that way. After two years of juggling work and graduate school, Wilson, the son of a photographer and art teacher, earned his master’s degree in user experience design from Carnegie Mellon’s School of Design. He received his degree last week during CMU’s Commencement Weekend. Earning the degree was the logical next step for Wilson, a desktop publishing coordinator who “does a little bit of everything” in the History Department. He creates websites and posters to promote events and serves as the department’s photographer and social media manager. He also works for the Dietrich College Dean's Office. One solution could help homeowners. Wilson’s final team project, “Orion,” is a smart home device that monitors energy and water usage. “If you were using a lot of water or energy, it would notify and encourage you to use less. It also might connect you to information about where your water and power come from in order to increase your awareness and knowledge of the whole energy process,” he said. Wilson is grateful to the History Department for enabling him to pursue his advanced degree. His daytime classes took place Monday through Thursday, so he came to work a little early, took two to three hours in the middle of the day for class, and then returned to work and stayed late. He never missed a class in two years. Wilson said he won’t miss the workload but will miss the learning, the professors and his classmates. “It was a great experience and great exposure to a lot of people and a lot of really smart minds,” he said. One of those smart minds was Molly Wright Steenson, who taught a seminar on the current state of design. Steenson was recently named the K&L Gates Career Development Professor of Ethics and Computational Technologies. “She was the professor in my very first class. I was a little nervous and she walked us into grad school very well. She made a big impression on me,” Wilson said. Prior to joining CMU in 2006, Wilson earned his bachelor’s degree in multimedia and web design at the Art Institute of Pittsburgh. When he’s not designing, Wilson likes to hike the trails in city parks and travel. 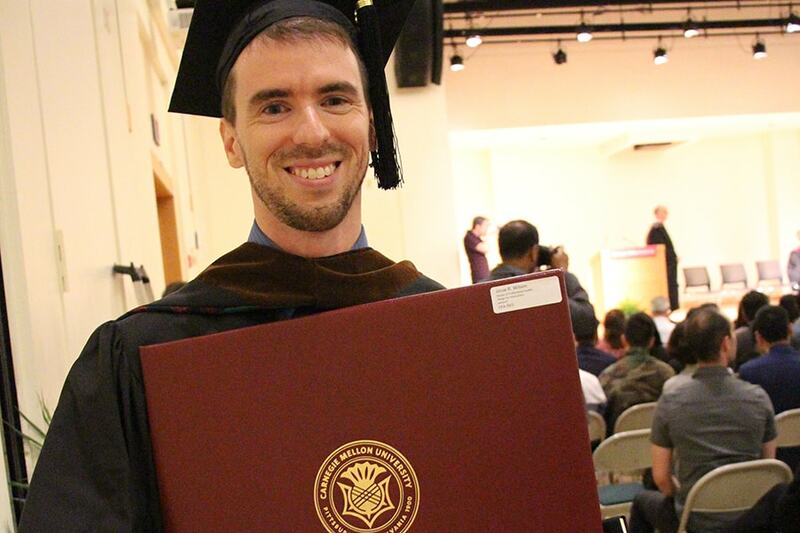 After two years of juggling work and graduate school, Jesse Wilson, a desktop publishing coordinator in the History Department, earned his master’s degree in user experience design from Carnegie Mellon’s School of Design.